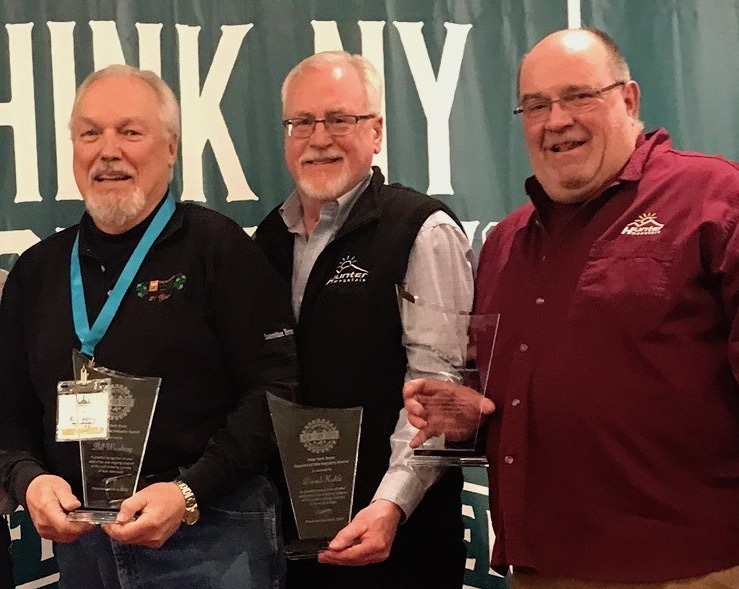 TAP New York Organizers received a special award at the NY Craft Brewers Conference. The 22nd edition is set for the end of the month April 27-28. From left, Bill Woodring, David Kukle and Danny Pickett. TAP™ New York returns for the 22nd year running, Saturday, April 27 from 2 pm to 6 pm and Sunday, April 28, from 12 noon to 4 pm at the Hunter Mountain Ski Resort in Hunter NY. The ticket price includes food, all the beer samples you can handle, live music, cooking demonstrations and plenty of friendly opportunities to mingle with brewery owners, brewers, maltsters, hops and grain farmers, writers, bloggers and other NY beer personnel. This year’s food theme is “Wraps”. NY State just began taking applications for Mead Farm Brewing Licenses. This is great news for the craft beverage industry and for the myriad of apiaries that operate here. When visiting farm breweries, you can now look for guest NY meads to be sold there as well. Sloop Brewing in Fishkill is participation in Autism Awareness Month with an April 4 event called Eat For Autism. Between 4 and 10pm, 10% of all sales at the Fishkill location will be donated for distribution to local affected families. New Sloop cans include The Red C, 8% Double Plus Good Citra and Mosaic DDH DIPA, and Confliction. Justin Taylor just brewed a collaboration beer with Mikeller in San Diego in late March so look for that Breakfast IPA, made with cinnamon, maple and vanilla, to be out soon. Chatham Brewing just released their spring Beers that include Nor’ Eastah, Bombogenesis, and Clippah. Brown’s Brewing in Troy and Walloomsac will soon release 16 oz cans of a new IPA named Carla that is brewed with Citra and Mosaic hops. Their latest available bottled sour beers include Solera, a blend of oak aged sour ale made with Pinot Grigio grape juice and Beacon, a tart saison aged in oak with lemon verbena. In April, look for John Popper, accompanied by Blues Traveler’s Ben Wilson on April 11 in their Brown’s Revolution Hall in Troy. At Hyde Park Brewing, several new spring beers will be out in April. They include a new Cherry Stout that will follow their Dry Irish Stout tap, a new Raspberry Wheat Ale, and an all Hudson Valley, New York Vienna Lager that was collaborated on with Rip Van Winkle Brewing in Catskill. The Vienna Lager was made exclusively with malt grown at nearby Migliorelli’s Farm in Red Hook and floor malted and hand tended by Hudson Valley Malt in nearby Germantown, and Cascade Hops grown by Kinderhook Creek Hop Yard. Shrewd Fox Brewing in Glen Spey has several seasonals out to greet the spring. They include Kutya Osela Winter Farmhouse Ale, Baba Yaga Harbooz Pumpkin Ale, Sand Peach Wheat, Highland Steam Lager and many of their popular barrel-aged beers like SHugəriNG Maple Syrup Rye Barrel-Aged Lager and Sir Isaac’s Apple Brandy Barrel-Aged Lager. Rushing Duck Brewing in Chester has 8.6% War Elephant DIPA back on tap and it is joined by another big beer, the 11.2% Imperial Ryezenbock. These join their latest sour in the Malaphor Series that is a red colored Berliner Weiss made with black currants and limes. Keegan Ales in Kingston now has cans of FUN, Hudson Lager and Monkey Trials available for purchase at the brewery with some distribution to follow. At Indian Ladder Farm Brewery and Cidery in Altamont, there are three beers made entirely from their farm ingredients. The first is Orange Whip NYIPA that they made with some orange puree; the next one is The Hell You Say Belgian Tripel that was lagered for three months and the third one is Thanks for Saying Thanks Blueberry Sour made with their own farm blueberries. These beers join two NYIPLs: Homie Haulers made with NY malt, their estate hops and dry hopped with Mosaic and Tandem Haulers Double NYIPL made in much the same way. Two collaborations beers round off their beer slate: Creatures From The Farm Mixed Fermentation Saison made with Creature Comforts Brewing in Athens, GA using all ILF grown ingredients that will be out in May and Pigs & Ladders Kölsch made with Prohibiton Pig in Waterbury, VT using ILF grown Sterling hops that is available now. July 20th, their farm will host a Farming Man Beer Festival with some breweries from across the country. Check out the tickets on sale on eventbrite.com. CH Evans Brewing in Albany will have a bus going to Tap NY for 95 bucks that gets you transportation, a tee-shirt, light breakfast and plenty of beer. New beers on for the spring include 5.5% Melville’s Wit American Wheat brewed with wheat malt, oats, coriander, orange peel and Citra hops, 5% Munich Lager made with 50% Munich malt and 8.5% The Dirty Bear DIIPA brewed in collaboration with Slidin Dirty and Black Bear Inn and hopped with Simcoe, Mosaic, Citra, Loral and some other experimental hops. They also made another iteration of the 19th Century Albany Amber Ale that is 4.5% and crafted again in collaboration with the Albany Ale Project and Discover Albany. It is made with all NYS ingredients and allows the modern hordes to sample what a 19th century table beer would have tasted like. Arrowood Farms released their latest mixed fermentation IPA – 6% True Love in an Arranged Marriage, a mixed fermentation IPA made with Columbus hops in the boil, Mosaic, Hallertau Blanc and Pacifica in the whirlpool and then heavily dry hopped and it is available at the Brewery in Accord and in the Outpost taproom in New Paltz. Crossroads Brewing will now be distributed in Long Island through a deal with Hicksville Beverage and you can find their Black Rock Stout in the Delta Suites at Madison Square Garden. Right now you can get 12-packs of their Greens Fees Pilsner and be on the lookout for a collaboration Mexican Lager to be out in April or May made with The Brewery At The CIA. At Fox N Hare Brewing in Middletown, new beers coming out in April include Spring in The Hare Saison and Delaware Ryesing RyePA. These will be followed by their very first sour mash beer, Blackberry Blossom Berliner Weisse that is either aged on blackberries or served with blackberry syrup. Great Flats Brewing in Schenectady will be joined by Gourrmeli’s Taste Food Truck April 13 and on April 27 – Fin Fishmonger will be on site. Great Life Brewing in Kingston NY won a Gold Medal for their Classic Cream Ale and a Bronze Medal for their Grrreat Scot Wee Heavy in the 2019 NY International Beer Awards. Rip Van Winkle Brewing won a Bronze Medal for Mountain House Helles and Chatham Brewing won Bronze for their Bock & Bock Beer and Bronze for Spike Devil Porter.